Environment Minister Leona Aglukkaq's announcement of new emissions targets hasn't reassured Ontario Prem ier Kathleen Wynne. She argues Ottawa needs to come up with a more concrete plan. Both Kathleen Wynne and Leonna Aglukkaq join The House. The federal government is considering buying international carbon credits as one way to meet its ambitious new emissions reduction goal. 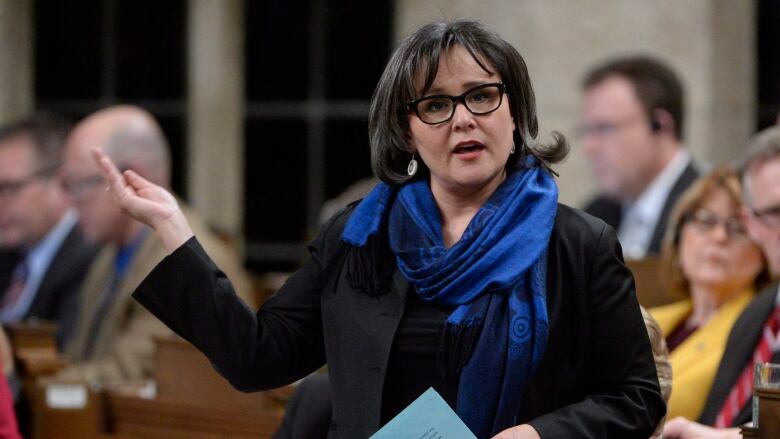 "We want to consider international mechanisms that actually produce real results in emissions reduction," Environment Minister Leona Aglukkaq told Evan Solomon on CBC Radio's The House. Carbon credits invest in green projects in other countries and balance out rising emissions in Canada. That's something the Conservative government had vowed not to do in the past, with former environment minister John Baird calling them "hot air credits." "We haven't said yes to it, we haven't said no to it. We want to explore what this means only if it reduces greenhouse gas emissions," Aglukkaq said. That answer is too vague for Ontario Premier Kathleen Wynne. She wants clarity from the federal government on how it plans to move forward on its new climate commitment to reduce greenhouse gas emissions by 30 per cent below 2005 levels by 2030. "It is not enough in my opinion for any jurisdiction in 2015 to have a nebulous notion of a target they're going to reach without being able to lay out a specific plan that's going to get them there," Wynne told Solomon in a separate interview with The House. "That's what we're going to continue to call on the federal government for," she said. Indeed, the Wynne Liberal government is doing just that, with Ontario Environment Minister Glen Murray sending a strongly-worded letter dated May 15 to his federal counterpart. "The federal government must act and do more on climate change rather than simply provide a tally of initiatives as 'Canada's' contribution to fighting climate change," the letter states. Ontario recently announced it will adopt a cap-and-trade system to reduce greenhouse gas emissions, but the province has yet to provide details on how exactly that system would work. Back in 2009, the federal government committed to reduce emissions to 17 per cent below 2005 levels by the 2020. A report last year by the independent environment commissioner found strong evidence that this original target will be missed. The environment minister acknowledged the new target is an ambitious one, but said 2030 is "a time away." "It's a very ambitious plan and it's an ambitious target," Aglukkaq said. "We all have a role to play in reducing greenhouse gas emissions in Canada. We all have to do our part to move forward." Wynne said the provinces are already doing their part; now it's time for the federal government to step up. "I think the federal government needs to do more than just add up the targets the provinces are putting in place. I think they need to push a bit more," she said. Some of Wynne's suggestions for the federal government include building retrofit programs, energy conservation and storage and investment in green infrastructure, including transit. In the past, Canada has linked its targets to those of the United States, but this latest goal marks a departure from that tradition. Now, all the government is saying is that its new target is in line with "industrialized countries." "We've been very clear that in Canada where the industry is integrated with our trading partner the United States, we want to align our regulations," Aglukkaq told Solomon. "But we've also been very, very clear that we want to ensure that the industry remains competitive with our closest partner...we will not introduce regulations that will put Canadian businesses and industry at a disadvantage with our trading partner." The United States is committed to a 28 per cent reduction of its greenhouse emissions from 2005 levels by 2025, five years earlier than Canada's new goal. The European Union has a 40 per cent reduction target by 2030. "Canada is showing leadership in addressing climate change and greenhouse gas emissions," Aglukkaq said, adding that "we don't know what other countries' targets will be by 2030." FULL EPISODE: How will Canada meet its new emissions reduction target?